All concerts are rain-or-shine with no entrance fee. 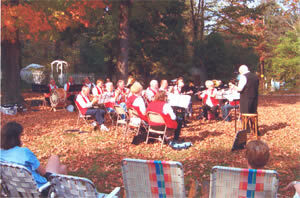 The band has been entertaining audiences in and around Grafton since just after the Civil War. What's the best part of a summer concert on a Vermont town common? Familiar music? The surroundings? The sense of tradition? The spontaneity? The informality? The price? If you ask the players, they would say the audience. It's all good. For a summer concert in Grafton, you'll want to bring a blanket or some chairs. Don't worry much if you forget the blanket. If the grass is very wet (or getting wetter), we'll move indoors to the White Church. You may want to bring a picnic, but forgetting the food could be a good idea because of the many choices in the General Store. The audience/band distinction can be blurry. Often, visitors join us behind the music stands. Whether you're a summer resident or weekend visitor, you're welcome to sit in and play with us (assuming you're familiar with band music). We may even have an instrument to lend. We've had "ringers" from as far as England and as young as middle school. Our concerts are always free, but we do pass a hat for donations to help cover the cost of heating the band hall during rehearsals, instrument maintenance, director stipends, a little insurance, some new music, and an end-of-year party for the musicians. Donations really are optional. We're a 501(c)3 organization, so you may want to let the hat pass by and make a later donation to get a proper receipt. Learn more about Grafton, Vermont at the Town's website.